medium with the average bust of 36". -- Please Select --Small ( to 5'4") 44" Medium ( over 5'4") 48"
Comfortable, yet distinctive traditional robe appearance, concealed front opening zipper, two pocket slits with open sleeves. These great robes are carefully tailored with your comfort and appearance in mind which makes them easy to wear. The deep black fabrics are colorfast and completely washable, it can be done at home. They are made easy to care. Comparing the prices, these robes are affordable. Available in 2 sizes, your choice of material in either Broadcloth or Polyester and 2 lengths (back of robe from top at neck to hem) with an average 36" bust. Size Small up to 5'4" or 44" length or Medium over 5'4" or 48" length. Broadcloth is a featherweight, washable, year-round blend of 65% polyester and 35% combed cotton. Very comfortable. Black. 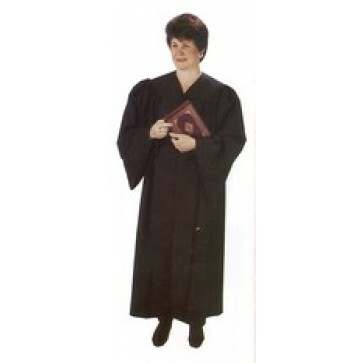 Polyester is a medium weight washable polyester robe. The deep black fabric holds its crisp dignified shape better than any pulpit robe you have ever worn.